In general, the earliest maturing garden bean varieties are all bush beans, or bean plants which do not require trellising. Most bush bean varieties reach maturity between 50 and 60 days, whereas most pole and lima beans need anywhere from 65 to 110 days to mature. 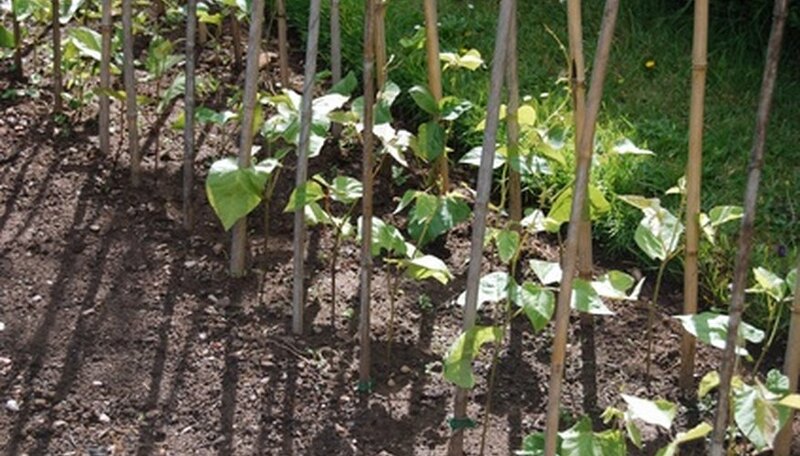 Half-runner types have growth habits between bush and pole beans, and while they are typically grown as bush beans, yields may be increased by using short string trellises. This is among the earliest maturing bush bean varieties available. Though the plants are dwarf-sized, they produce some of the longest pods of any bush variety, up to seven inches long. Tennessee Green Pod is well regarded in Southern gardens for its abundant crop. Pods from the Pink Half Runner can be used either fresh or dried: fresh snap beans are ready in 50 days, but dried beans require another month, maturing at around 85 days, at which point the pods turn a reddish purple. Pink Half Runner is also well suited for canning. Another fast-growing bush bean, Royal Burgundy lets the gardener know when immature purple-podded beans are ready for eating by turning them a bright green at maturity. Pods grow to between five and six inches long. Named for the small white seeds inside the pods, White Half Runner is another early maturing bush variety. Pods are eaten either as snap beans during the stage just before maturity or as shelled beans once the pods have reached full maturity. This intermediate-length bean can be eaten in many different ways. It is appetizing as a fresh snap green bean, but is also suitable for shelling, freezing and canning. Pods are four to five inches long. This variety is heat and drought resistant and thrives under many different planting conditions. One of the heaviest yielding bush bean varieties, Topcrop grows between 16 and 18 inches tall and bears an abundance of six-inch stringless pods that are excellent fresh as well as canned or frozen. Topcrop is also resistant to the common bean mosaic virus. Burpee Stringless bush beans require no trellising even though the sturdy, vigorous vines grow up to 20 inches tall. The six-inch pods are fleshy and brittle, making excellent snap beans. This All-America Selections winner is a cross between its two very popular parent varieties, Kentucky Wonder and Blue Lake. One of the earliest maturing pole bean varieties, Kentucky Blue produces smooth, round pods which reach six to seven inches in length at their prime. One of the most popular lima bean varieties in Southern-region states, Jackson Wonder is one of the earliest maturing lima beans available on the market. Each plant grows to between 16 and 20 inches and produces pods between three and four inches in length with three to four beans per pod.